Experience a taste of the extraordinary. 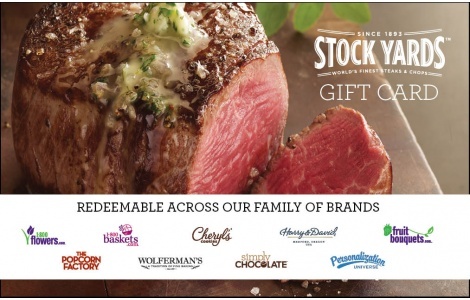 For over 100 years, Stock Yards has offered the highest grades of meat available - USDA Prime and USDA Choice, as well as the Certified Angus Beef® Brand,* giving you the widest possible selection of only the very finest beef. We only select from Midwestern corn-fed stock. All of our steaks are hand trimmed by the same master butcher who supplies our fine restaurant customers, to deliver only the most juicy, tender and flavorful steak experience. Our steaks are then expertly aged to maximize tenderness and flavor. Our wet-aging process allows beef to develop that extraordinary richness and tenderness our customers keep coming back for year after year. Our dry-aging produces a deeper, almost "woodsy" flavor sought by many beef connoisseurs. Stock Yards beef matures under ultraviolet light in a controlled airflow environment to impart the richest flavor. We carefully inspect each and every steak to ensure you get only the best. We'd have it no other way. This gift card can also be redeemed at any of 1800Flowers.com nine brands.